Members of the chapter expressed interest in building a global alumni relations program through regular survey feedback. As the chapter President, I took the initiative to develop an annual plan to develop and maintain these relations. This strategic plan is the first attempt in the chapter’s history to build an alumni database that will facilitate connections and value between members and alumni. Limited information was available on the chapter’s alumni for the last 25 years, which made this project challenging. Deliver on promises to members and fulfill the chapter’s mission by providing better alumni relations. Actively encourage members to participate in the alumni relations program. Increase program engagement and visibility by utilizing recent technology opportunities. Provide added value for alumni to increase membership acquisition, retention, and participation. Ensure quality program events by acquiring funding to support these efforts. 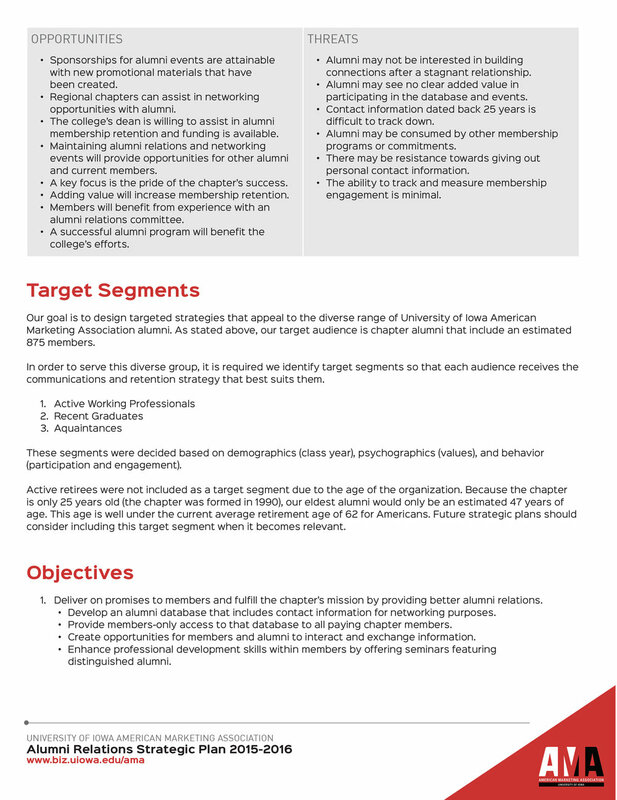 I developed a four page strategic plan that incorporated the chapter's goals to build an alumni relations committee. This strategic plan included outlining several key elements, including: the program mission, vision, values, situational and SWOT analyses, target segments, objectives, and measures of success. The Alumni Relations Committee was created in October, 2015 with 7 members in order to execute the plan. Chapter officers were discovered for 25 years of the chapter's history and added to the database. The strategic plan was used to garner support from the college of business's dean and administration for future functions and events.